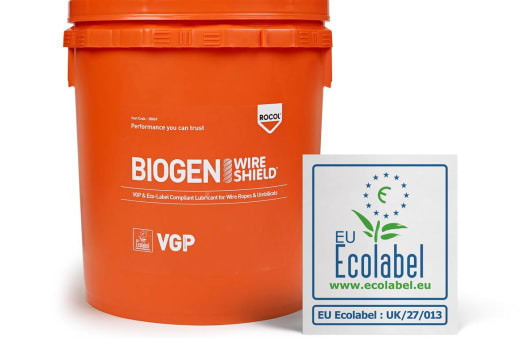 ROCOL are pleased to announce that BIOGEN WIRESHIELD has been awarded an EU Ecolabel licence (Licence no. UK/27/013). This is independent verification that the wire rope and ROV umbilical lubricant meets the stringent requirements of the US VGP regulations. BIOGEN WIRESHIELD enables the marine and offshore industries to meet much stricter environmental safety requirements without compromising on day-to-day operational performance. The BIOGEN WIRESHIELD lubricant successfully addresses the dual challenge for lubricants used in marine environments to be environmentally considerate and function to a high standard in the most demanding operating conditions. “Changes to the requirements set-out by the US Environmental Protection Agency (EPA) almost twelve months ago are acting as the catalyst for adopting a new regime worldwide involving only ecologically safe lubricants throughout marine operations. “The revised VGP (Vessel General Permit) requirements published by the EPA, which came into force in December 2013, forces marine and offshore operators in US waters to use only Environmentally Acceptable Lubricants in all oil-to-sea interfaces from their next dry dock onward. The lubricant’s pseudoplastic rheology means that shear or agitation causes a reduction in dynamic viscosity, which allows maximum penetration into umbilicals and wire ropes, as well as increasing pumpability during application to minimise blockages. Corrosion resistance is assured, with zero galvanic reaction after 1000 hours in salt spray testing and BIOGEN WIRESHIELD also offers shear stability in the presence of salt water, with little degradation in testing.